The third district in the Hunger Games is now open for business. 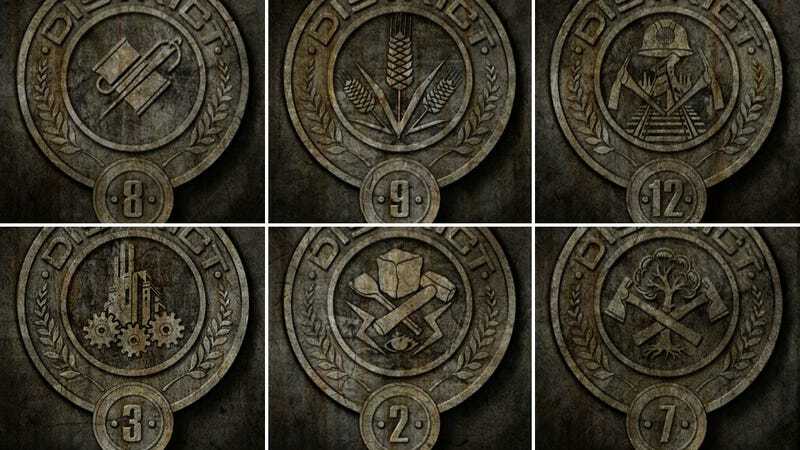 We have the first look at the District 3 seal, straight from Lionsgate's movie adaptation of Suzanne Collins' dystopian trilogy. Take a look at the seal along with 5 other district-specific seals from the film. Hunger Games is set in a post-apocalyptic world in the country of Panem (what was once North America), which is divided up into 12 Districts. Every year two child tributes are selected from each district, and forced to compete in a televised battle to the death. If you've read the books you know that the crafty folks of District 3 build TVs, cars, just about everything. They're known for "technology" — in fact it's their chief export. They've also got a keen eye for explosives, which comes in handy for one Tribute down the line. And the Tributes from District 3 will also play a huge role in book two. Now that this seal has appeared at io9, the world of District 3 is now open — and it's a place you can explore online thanks to the Hunger Games new online ARG. Head over to The Capitol and register for your own District Identification Pass. Here's what my personal District 8 pass looks like. Rumor has it these will be important later. And when you're done, check out District 3's new facebook page. Plus here's a collection of the rest of the District seals that have already been released on other sites. May the odds be ever in your favor!